An honors course of 150 students at the University of Texas requires short written assignments each week. The instructor had given prizes of $,1500, $1,000 and $500 to the top three papers at semester’s end. He abandoned this prize structure and now gives prizes of $100 to the three best papers each week. The instructor, an English professor, is unfamiliar with tournament models and the idea that larger top prizes and a steeper prize gradient will elicit more effort than a flatter gradient, one with more prizes of smaller amounts (Lazear and Rosen, 1981). My guess is that he wants to be fair rather than confer such unequal prizes; but he would get better written work if he went back to the old system, just as Tiger Woods is better motivated by a big winning prize for a whole tournament than he would be by small prizes for having the best score in a particular round. Alternatively, combine equity and efficiency by offering two $100 prizes each week, then one $1,000 prize at the semester’s end. It seems that in education at all levels, we are more concerned with fairness than with producing great results. I see a desire for consistency of output at play here more than fairness, since the effort isn't cumulative. Rather than offering large prizes for single papers and incentivizing spurts of learning and high quality output from students (students could write one great paper and take the rest of the semester off and still get the payoff), he's offering regular incentives to get higher quality work out of students every week. It makes sense that he'd prefer a higher average output from his students than a higher maximum output. In addition to the alternative you suggested, a randomly-selected "bonus week" with a prize of $200 for the best paper might further increase the quality of papers. It depends on whom you are motivating. 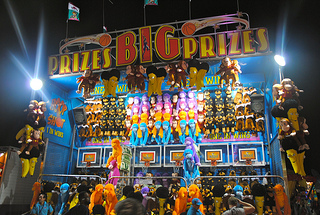 Larger prizes may motivate the top students more, although they are generally internally motivated so even this will have limited effect, but as easily demotivates the median from even bothering. Smaller prizes will have less individual effect but will induce broader participation. So the question is, is this to obtain the best quality papers from the top students, or to motivate the median student to do better? What really flabbergasts me is the idea of an instructor having to give prizes to motivate students, and in an "honors" course, no less. Still, I see it's Texas. Or the obvious response: What? Isn't the Noble/next big thing/etc. motivation enough? Isn't being the next billionaire enough? Smaller, more numerous prizes are more consistent with educational aims. Larger, uncommon prizes are more significant for filtering and results extending the bounds of knowledge and improving the condition of mankind. The question is why so many of the latter are focused on such unimportant areas, like sports. Personally, I didn't see the golf analogy playing out well. Tiger Woods needs to try on every hole to win the tournament because all of the holes are accumulated into a single, total score. This is not comparable to the three best papers of a semester. Also the top score on EACH hole is not quite the same. If you reward the top three scores on ANY given single hole, then you have a comparison. If Tiger gets a hole in one on a par 4, he doesn't have to try for the other 17 holes. He's secured his pay-out. If he mis-drives on a hole, he can take his time and just finish competantly - he doesn't have to try an excel. The cumulative effort for the whole semester, having to deliver multiple quality papers, for a smaller pay out isn't as enticing as having to have one superlative paper for a big payout. If I write a killer paper, I can sand bag other ones and still be in the running for a large payout. I only have to put through enough effort to pass, not wow the instructor. Next Post »Should Marriage Be More Like an Employment Contract?